And by yard work I do not mean raking leaves or cutting the grass! I do not think I will ever have to do that again. No, yard work refers to shipyard and our progress is slow. This is not due to us or the shipyard but rather the weather. 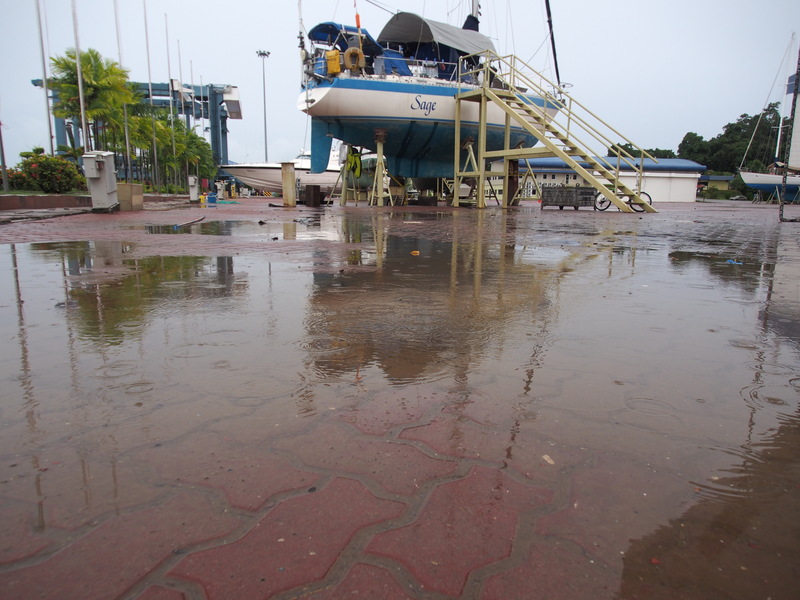 It is the SW monsoon season here and the weather is challenging. Last night it rained monsoonal type rain all night. We are living onboard while we work on all the projects. So, early morning, it is still raining, washroom call beckons, get out of bed, get dressed, head out the hatch, first douse of water from a puddle collected on the awning, umbrella up, down our stairway to heaven, it is dark, step off the second to last step and into a lake. Yup, a lake. 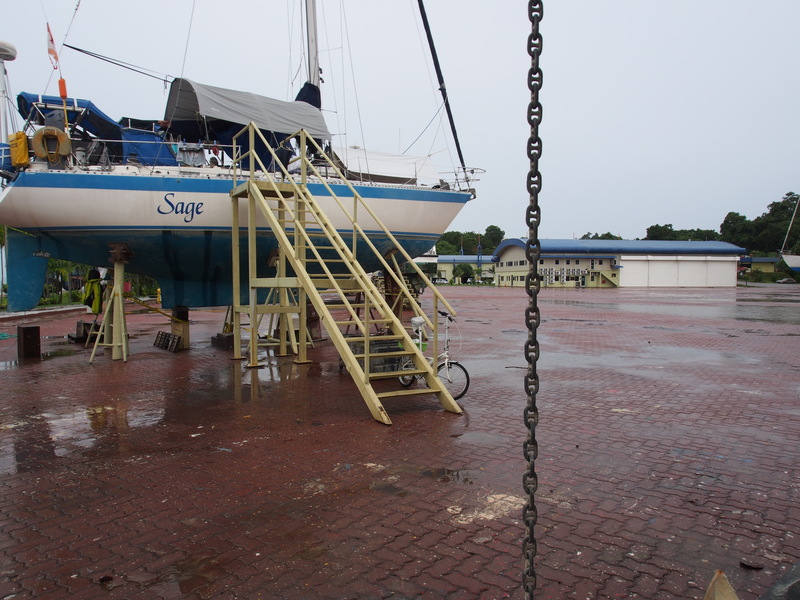 At least the portion of the shipyard where we are located was covered in about a foot of water. Connie was a little shocked as she looked out wondering how she was going to get over to the washrooms but then she saw something float by. Umm, it was part of all my working materials I had stored under cover and under the boat. Even the following day we were wondering where things had gone. Just walk down the yard and they turned up in the ditch. What can one do but laugh? We are not hauled out in Alberta but….So, another couple of days have to be added on to the whole project due to weather. It is not like we have to go back to work next week! In the meantime the centreboard is under cover and progress is being made. We are on schedule as far as that goes but it is the painting projects that are suffering. I do not want to paint with $100/litre paint and have the paint destroyed by rain. 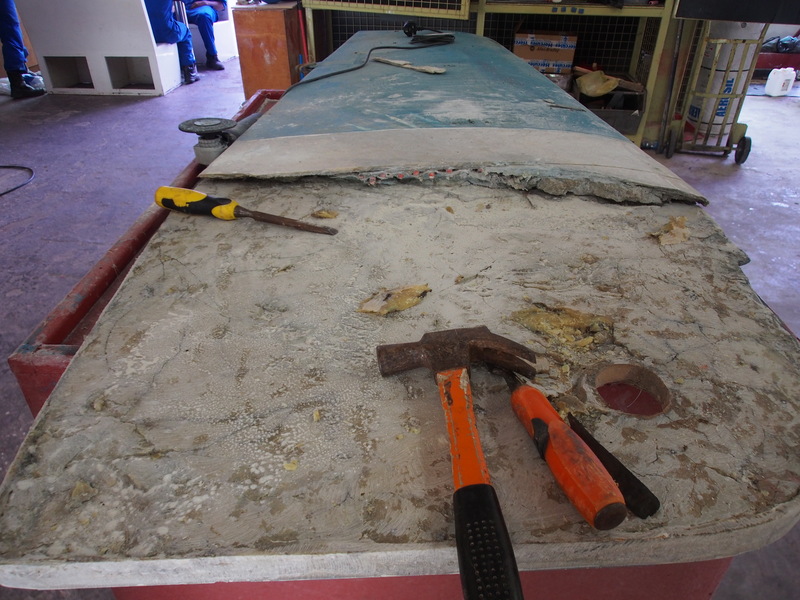 Work on the centreboard is progressing.